Welcome into the gateway to the Highlands. Lochearnhead is a small village with some 250 inhabitants at the head of Loch Earn. It is at the junction of a major route north from Glasgow and Stirling and an east/west route between Oban and the Isles to the west and Perth , Dundee and St Andrews in the east. This easterly route also brings traffic from Europe. Lochearnhead is steeped in history from the Mesolithic-Age, the Bronze Age with the crannogs on Loch Earn, the evidence of Pictish and incoming Scots from Ireland and the feudal estates of the clans McGregor, McLaren and Stewarts. Edinample Castle at the western end of Loch Earn is a reminder of times past. Built by ‘Black' Duncan of Glenorchy who is rumoured to have murdered his architect on completion of the project, it is a fine example of a 16 th century ‘tower house' and has a bottle dungeon. On the north shore at Earnknowe, there is a McLaren burial ground of the McLarens of Ardveich. 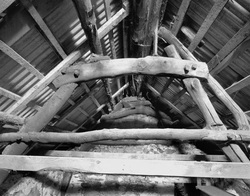 The area was, until the turmoil of the Jacobite rebellions, a scattered collection of cottages, crofts and more spacious houses connected with the clans. The village became more prominent with the construction of a military road from Stirling to Fort William in 1750. It followed an old drover's route up Glen Ogle. The remains of an old General Wade bridge are still plain to see. 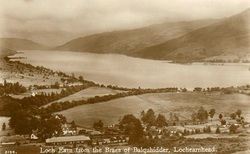 It was at this time that the first part of the old Lochearnhead Hotel was built. The arrival of the railways in Scotland was the next major change when in 1870, the Callander to Oban section was built with the local station for Lochearnhead being sited at Balquhidder Station, some 2 miles from the village. A link from this station to Perth was established in 1904, when the village had its own station but sadly this branch was closed in 1951 probably due to the arrival of family motor cars and road transport. The most prominent remains of the railway era are the viaducts in Glen Ogle, the rock fall which closed this line in 1965 and the Lochearnhead Railway station now occupied by the Hertfordshire Scouts, a centre for outdoor adventure holidays. With the railways came tourism and the village developed further with more hotels and water activities on Loch Earn, including a motor vessel, the Queen of Loch Earn. This vessel plied its trade between St Fillans and Lochearnhead and passengers were often greeted by a piper. Loch Earn is a well known centre for anglers and boats can be hired from Drummond Estates Boat Hire. The loch and the whole area abounds in wildlife and in recent years ospreys have become regular summer visitors and a wonderful sight if spotted dropping onto the water to fish. Red squirrels are regularly sighted and red deer are joy to hear in the “rutting” season in October. The Fishing, golf, walking, wildlife and history enthusiast will all be at home here with a superb choice of accommodation in the area. Lochearnhead and Loch Earn is truly a centre for all seasons.